Antonio Brown went from a virtually unknown, mid-round player, to a regular Pro Bowl selection for the Pittsburgh Steelers in just a few seasons and started gaining the attention of the hobby along the way. 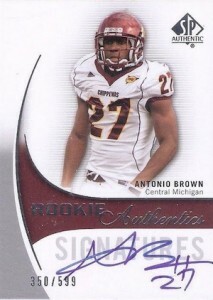 As a result, Antonio Brown rookie cards have surged in valued and interest. Lightly used in his rookie year, Brown's breakout season came in his second season when he was named to the Pro Bowl for the first time. He has remained near the top of the leaderboard for receiving stats since then, earning multiple First-Team All-Pro designations. Shop for Antonio Brown cards on eBay. 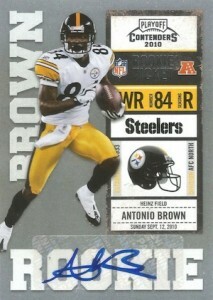 Collectors can find Antonio Brown rookie cards in 2010 products. Most fall in the low- and mid-level range, but several autographed options are available and are the most popular. 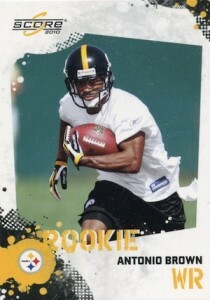 It is important to note that Antonio Brown rookie cards were not included in any Topps products during the 2010 season except for Bowman Sterling. Upper Deck also offers several college cards for Antonio Brown. 2014 Topps Fire Antonio Brown Wood Parallel SP #20 25 Steelers RARE! !